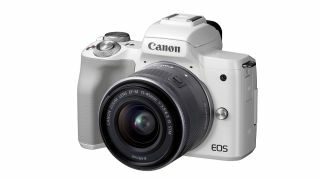 As well as refreshing its DSLR lineup, Canon has also announced a new entry in its mirrorless M series, the EOS M50. However, if you’re thinking this’ll just be a routine mirrorless upgrade, think again. Canon has packed in plenty of new features for this new release, some of which are firsts for the M series, and some of which are firsts for Canon cameras as a whole. Lots to get through. Let’s dive in. Built around a 24.1MP APS-C CMOS sensor, the Canon EOS M50 is the first model in the M range to be able to shoot 4K video, as well as producing 4K time-lapse and 4K frame grabs. This is thanks to the DIGIC 8 processor, which is not only a first for the M line but also a first for any Canon camera. Read more: Are the best compacts as good as mirrorless cameras and DSLRs? This new processor also supports various other features and improvements. The EOS M50 carries a standard maximum ISO of 25,600, as well as 10fps continuous shooting with single AF and 7.4fps with continuous AF. Its updated Dual Pixel AF system carries 149 AF points with broad frame coverage, while the processor also enables extra assist modes such as Auto Lighting Optimiser, Digital Lens Optimiser and Highlight Tone Priority. As you’d expect, the EOS M50 is fully connected, with Wi-Fi and Bluetooth connectivity options available. Users can set up automatic transfer of images to smart devices, or to PCs and Macs with Canon’s Utility software installed. Using the free Canon Camera Connect app for iOS and Android, users can also take control of the device for remote shooting. Read more: DSLR vs mirrorless cameras: How do they compare in 2018? Another interesting new feature on the EOS M50 is the inclusion of a brand new Raw format: CR3. Users also have the option to change Raw settings to prioritise image quality or file size, with a new compressed C-Raw that produces files up to 50% smaller, with a slight drop in quality as trade-off. Design-wise, the EOS M50 follows in the footsteps of the rest of the M series, with a miniaturised-DSLR look. It brings in a 2.36-million-dot OLED EVF and a 1.04-million-dot fully-articulated touchscreen, the latter of which offers touch-and-drag focusing for those who prefer to compose using Live View. Also, in a nice touch for video shooters, it carries an external microphone socket. The Canon EOS M50 is expected to be available for purchase from March 2018. Pricing-wise, it’ll be available for £539.99 body-only, or £649.99 in a bundle with the EF-M 15-45mm lens.